El Salvador, country of pupusas ! Friday January 31. The Unión, El Salvador. Barely have we dismounted that we find ourselves back on the saddle. 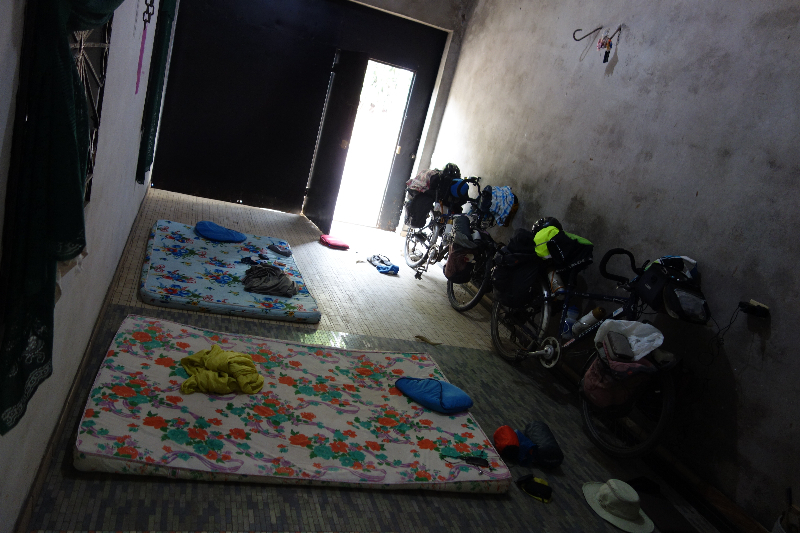 It is 4 p.m., but the day is not over yet, we still have 40 km to ride before we can set our bikes in standby mode. Why this rush? 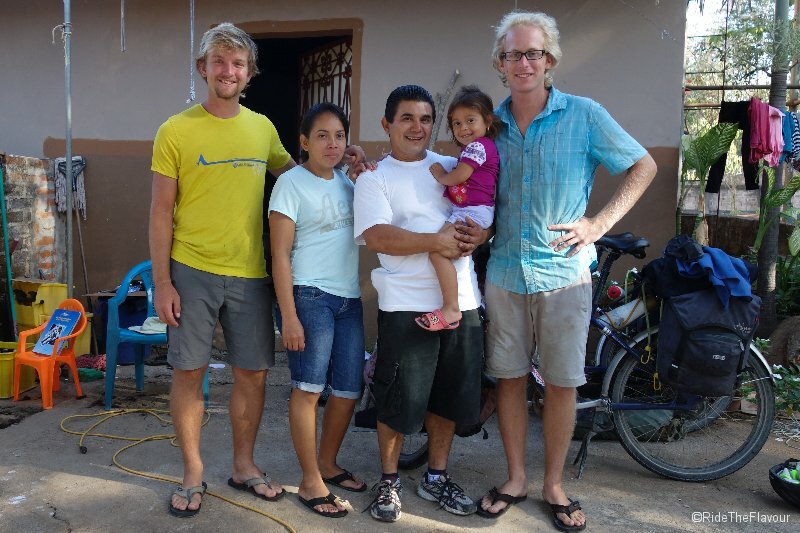 A few days earlier, we had contacted José via the cycling community warmshowers.org and his answer was really pleasant to read: “Mi casa es vuestra casa!” My house is your house! Such an invitation justifies easily a little extra kilometric. You’ve guessed it, José lives 40 km far from La Unión! We stayed 3 days José and his wife, Mary. Our program? Cleaning, loading and unloading bags of corn (corn trade is the “hobby” of our host, a real workaholic 😉 ), climbing the volcano San Miguel, a brief interview for a french radio broadcast, Allô la Panète (online here), and learning how to cook the typical Salvadoran meal, las Pupusas ! 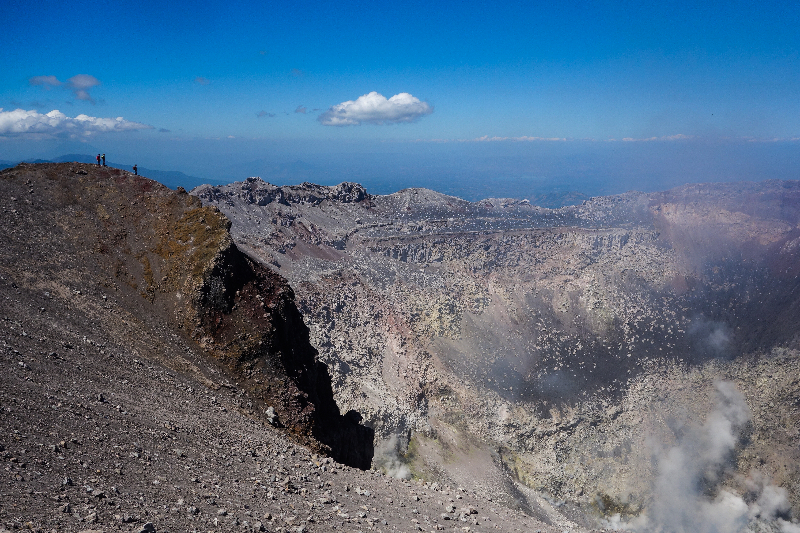 We couldn’t dream about better way to start our discovery of El Salvador. A big thanks to you, José and Mary, for this colorful stay! And the ideal did not leave after the meal. Satiated, we now needed to fnd a place where to sleep for the night. So we ask the two cooks, a mother and her daughter, if they would have a garden where we could pitch the tent… “Wait for my husband to return, you’ll see with him,” replies the mother. A little later, we meet Abel. We talk about our trip, and then about him and his family, confidence develops immediately and, as we are trying to hide a yet another yawn, he stands up and walks us through his huge house to show us where we will sleep, not in the garden but in his garage, the ideal was about to fill our night… Oh, but here he comes again. “I have brought you mattresses”, he says. The ideal then tiptoed silently his way out, while the perfect draped our night little by little by his fluffy aura. 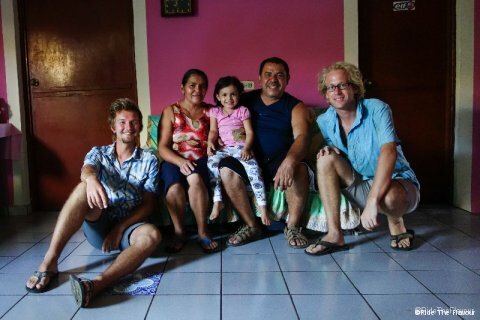 The next day, we have breakfast with Abel, he tells us about the not so distant civil war, the new politics in El Salvador, the American dream and all these Salvadorans (including his own son) who illegally cross borders up to the Promised Land. We then say good-bye to each other: he takes a bus to do business in the city, and we start riding toward Guatemala. Muchas Gracias Abel y a tu familia por su amabilidad y hospitalidad! It is 9: 30 a.m., the Sun is still far from its zenith, but already its warmth radiates El Salvador. Fortunately, we have been riding in Central America for a month and we are now used to this heat. And also, as we like to say: “We’ve been to Morocco, and it was worse!” But today, the relief wants to see us melt. The coast looks like a saw-tooth, whether you are looking at it from the sky or the sea. Over a ditance of 40 km, the road is a rollercoaster without surprise: a left turn, an uphill, a right turn, a downhill, and so on. The atmosphere warms up, and we surely contribute to this phenomenon: during these 40 km, we are like mobile hotspots about to implode! The next morning, Friday, February 7, after a week spent in El Salvador, we entered Guatemala!